I am now spinning the last of the batts I got last year at SAFF. It’s different from other batts that I’ve worked with in that is a single fiber type, merino wool. I was drawn to it because of the lovely colors – red, orange, purple, green, gold – with red and orange being predominant. 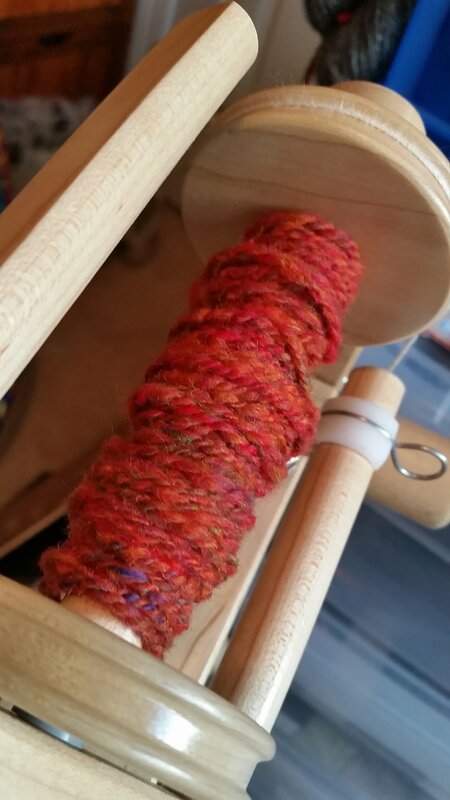 As you would expect, then, the spun yarn is primarily red/orange with other flecks of color that make it visually interesting and provide depth. It’s very fall-ish, appropriate for the season. Because it’s a batt, created on a drum carder, the fibers are not all lined up as they are from other prep methods. If you are familiar with merino yarn spun from top (where the fibers are all aligned) you know it’s very smooth and almost not like wool at all. THIS yarn is much fuzzier and has slubs and loft even though I am spinning it using the worsted method. It’s interesting to spin because merino fibers are not very long (compared to other wools) so you have to stay right on top of your drafting. BUT it’s also very “grabby” because of the prep, so it doesn’t slip apart easily. Because of the fuzziness, I’m interested to see if it feels scratchy against tender skin. I like to test that by taking the yarn and wearing it around my neck for a while. Guaranteed if it’s scratchy that I will feel it there! This entry was posted in Art, Fiber and tagged Art Batts, Batts, Merino, Spinning. Bookmark the permalink.